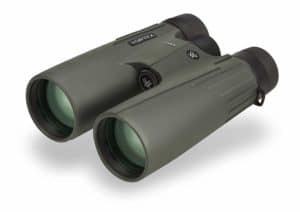 After my recent comparison of the Nikon Prostaff 3s vs 7s Binoculars full size( 8×42 and 10×42 models), some of the readers have asked if I could give them a comparison of the Zeiss Terra ED 10×42 vs Vortex Viper HD 10×42 binoculars. After gathering some users experiences with these two models, I decided to write a detailed article sharing it with you all. 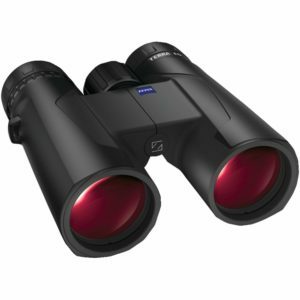 Not long ago, Zeiss, a leading German optics company announced that the new Zeiss Terra ED binoculars were available on retail stores. The versions that were released are of four models namely; 8×32, 10×32, 8×42 and 10×42. These models came in different colors, thus the classic black armoring and in a modern bicolor design in black/gray and black/green. The Zeiss Terra ED is deemed the entry level to Zeiss binoculars, if you are familiar with this brand, you will agree with me that they create only premium binos which also comes with premium prices. The binoculars that the Zeiss Terra is going against today is the Votex Viper HD of America. Vortex is a well known American brand. They also make very good binoculars that don’t fail you indoors or outdoors. Votex is also well respected in the industry for quality performance. 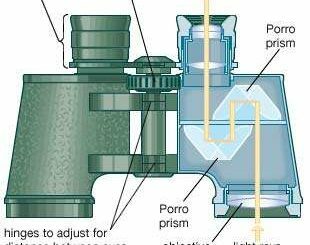 Just a side note, Vortex company is based in the USA but they get their binoculars parts from China and Asia and they are only assembled in America. The patent designs are invented by the Vortex company and they outsource the manufacturing to Asia. Don’t be taken aback if you see some of these US companies send you binoculars with “made in China” on them. Editor’s choice of the two is the Vortex Viper HD. it is a prime performer, particularly in its price range and with that wonderful build quality, it’s just slightly below the $1000 models. Below is a table comparing the specifications of each binocular. 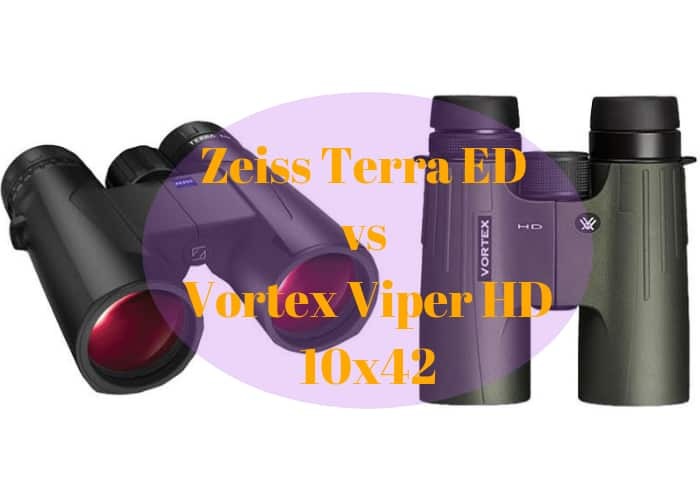 When I compared them in terms of price, although both binos are in the mid-price range, the Zeiss Terra ED 10×42 is much affordable compared to the Vortex Viper HD 10×42. The Zeiss 10×42 Terra ED is just below $500 and the Vortex Viper HD is above it as at the time of writing this post. Making the Vortex Viper a bit more expensive than the Zeiss Terra ED. The Zeiss Terra ED Binocular comes at such a budget-friendly price point than the Vortex Viper HD. especially if you are on a $500 or below budget. Nonetheless, the Vortex is really worth the extra bucks. Remember, high-quality binos comes at a high price. In terms of weight and size, the Vortex Viper HD which weighs 697.4g and is about 7.4g heavier than the Zeiss Terra ED which weighs 690g. This is really not a bigger deal for the extra grams is not that much. Size wise, the Vortex Viper is slightly bigger with just 1cm which is negligible as well. So their sizes and weights are not too far apart. Both 8×42 and 10×42 models are very popular among bird watchers, hunters, and general nature observers. Because these models are easy to carry and move around yet still get clear and brighter images. Those with higher magnification often don’t produce clear images with hand movements. Because the movement of your body affects the image quality. 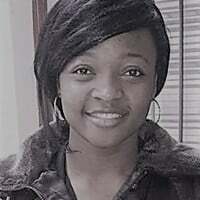 To tell the truth there isn’t much between the two. But the Vortex Viper is outperforming the Zeiss Terra ED in terms of visual qualities this is due to its high definition multi-coated lenses and dielectric, multilayer prism coatings. This makes the Viper produce better sharpness and minimizes the chromatic aberration. But in terms of edge sharpness, they are both equal. However, the Terra ED does have a larger field of view at 375.0′ @ 1000 yd while the Viper ED is at 319′ @ 1000 yd. They both have a wide field of view but if you are really interested in more field of view then the Terra ED will do better. All the same, both are great in this aspect. The Terra according to a user experience gives a very small amount of glare when viewing a high-contrast image with a cloudy background. You only notice it when viewing slightly downward or upward.if you are viewing head-on, you won’t notice it. They are both roof prism binoculars which are ergonomically designed for easy and comfortable handling. The build quality and general handling of the Viper seemed superior though. For lightweight without sacrificing strength, the Terra ED binocular’s chassis is made of glass-reinforced polyamide. This makes them durable and lightweight. See Vortex Viper HD 10×42 Review on this Video below. These two models are both among better quality representatives in their price class, Honestly speaking, they are both well made. Zeiss did do well with its first generation of low-cost binoculars. But if you are not on a tight budget, the Vortex Viper is the Winner of the Two. Vortex Viper HD 10×42 vs Nikon Monarch 7- Who Wins!